Hery RAJAONARIMAMPIANINA was born on 6 November 1958. He is an economist and chartered accountant. He is married to Voahangy Rajaonarimampianina and is a father of five children. In 1982, Hery RAJAONARIMAMPIANINA graduated with a Master’s Degree in Economics from the Faculty of Law, Economics, Management and Social Sciences of the University of Antananarivo. He subsequently pursued a postgraduate study at the same university. In 1986, he earned a Master’s Degree in Accounting from the University of Trois-Rivières, Quebec, Canada. In 1987, he returned to Canada to complete his professional training and received a Diploma of Certified Accountant from the General Accountant’s Association (CGA) in 1991. The same year, Hery RAJAONARIMAMPIANINA returned to Madagascar. He worked as a chartered accountant and held teaching positions. He was a lecturer at the National Institute of Accounting Science and Business Administration (INSCAE) and headed its Department of Research from 1991 to 1995. He was also a professor at the University of Antananarivo and at the IAE of Metz. His experience in teaching during these years is reflected in his rhetoric as President today. 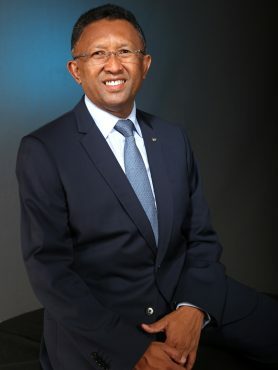 In 1995, he founded C.G.A, an accountancy and statutory audit firm which rapidly gained a strong reputation among the business community in Madagascar. From 2003 to 2008, Hery RAJAONARIMAMPIANINA was the Chairman of the National Order of Chartered Accountants and Statutory Auditors of Madagascar. In 2004, he took the vice-chairmanship of the Supreme Council of Accounting (CSC) before being appointed Advisor to the National Committee for the Safeguarding of Integrity. In 2009, Hery RAJAONARIMAMPIANINA was appointed Minister of Finance and Budget, a position he held in the midst of a particularly acute political crisis in the country. Despite the freezing of all foreign aid throughout his tenure, he successfully managed to contain inflation and keep the Malagasy currency stable. He also ensured the payment in due time of all civil servants’ wages. In August 2013, he resigned from his cabinet position and announced his candidacy for the election of the President of the Republic as the flag-bearer of the “Hery Vaovao Ho an’I Madagasikara” movement. Following the second round of election held on 20 December 2013, he was declared President-elect on 17 January 2014 by the National Election Commission for the Transition, after winning 53.50% of the votes. He subsequently took the oath of office as President of the Republic on 25 January 2014. As the new president, his vision is to bring all Malagasy people to live together in harmony, to work for national reconciliation and to implement a development strategy that prioritizes economic recovery and employment, decentralization, the fight against poverty and support for youth. On 30 January 2014, he was warmly welcomed by his peers at the 22nd Summit of the African Union in Addis Ababa, an event which marked the return of the Republic of Madagascar into the international community. His presence at the various high-level world meetings marks his determination to restore international relations and have all international sanctions against Madagascar lifted. National reconciliation is also one of President Hery Rajaonarimampianina’s preoccupations. He continuously devotes his time and spares no efforts in working towards national reconciliation. He is fully aware of the difficulties and challenges posed by decades of rather chaotic changes in the political leadership which have spread fear and distrust and weakened values in the Malagasy political fabric. Yet the development of Madagascar and the welfare of its people remain his two major objectives. He has unwavering faith in a future of prosperity given the numerous economic potentials of the country and the aspiration of its young and hard-working population to a better life. In this regard, two elements underlie his actions: the stability of institutions and political life in an approach that promotes democratic rules and the call for political maturity of all actors on the one hand and a structuring and decentralized approach of economic recovery towards more responsible and inclusive development on the other hand. These are the objectives President Rajaonarimampianina sets for Madagascar. Very often, President Rajaonarimampianina speaks of Madagascar as « the island of new opportunities ». The COMESA Summit in October and the Summit of the Organization of Francophonie in November 2016 in Antananarivo marked the full return of Madagascar in the concert of Nations. President Hery Rajaonarimampianina is currently chairing COMESA and the Summit Of Francophonie. The full success of the Donors and Investors Conference held in Paris in December 2016 under President Hery Rajaonarimampianina’s leadership enabled to put together the financing commitments that will help finance the National Development Plan.